If you are, here reading this article – you are here for a good reason and that is to buy a crossbow. If you are looking for an ultimate weapon for hunting our Barnett Jackal Crossbow Review is for you. It is perfect for target shooting and hunting with its military design with enough dropping power when out in the woods. It is a lightweight bow with a compact design and durable enough to use anywhere! 1 Why the Barnett Jackal is perfect for hunting? 2 What is the hunters have to say? Why the Barnett Jackal is perfect for hunting? The first thing you notice on the Barnett Jackal Crossbow is the design. It has a unique style with a sleek military style stock. The foregrip is comfortable when placing your hand and great if you are out in the field hunting. It produces an arrow speed of 315 FTP and the quad limbs have high-energy wheels. You also receive included the synthetic string and cable. When hunting you need a lightweight weapon making sure you do not get tired of carrying it around. It has a draw weight of 150 pounds with a stroke power of 12-inches and delivers a 20-inch bolt as previously mentioned at 315 feet per second. The devastating energy it produces is 95 foot-pounds when it finally slams into a target. What is the hunters have to say? Some hunters have said that they have shot a game at 35-yards with broad-heads making a clear shot. If you do buy the Barnett Jackal Crossbow on its own you will still be receiving a fantastic crossbow, however, you can buy the complete package. 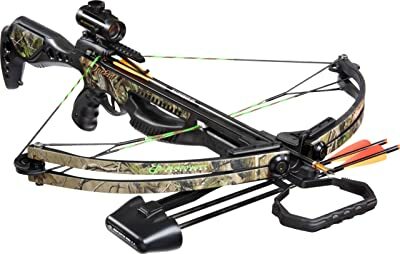 Buying the complete package you get a superb crossbow that is lightweight (not to mention the power included) but you also received some extra great features. It has a weaver rail system to attach any site, or scope to it. You receive a quiver to hold the arrows, three by 20-inch Eason arrows with Field Point Tips, and a 28 mm single red dot scope. Investing in the Barnett Jackal Crossbow Package saves you a bit when starting out as an archer. You receive it nearly fully sighted right out of the box, features a new ADF MIM trigger for a smooth 3.5-pound pull, and backed by a 5-year limited warranty. You receive a five-year limited warranty on the crossbow. The Jackal has received some great reviews from consumer rating it with 4.2 stars. The device is excellent to use for both target practice and hunting and clients are pleased with the crossbow. The only complaint that consumers had is the fact that the included string frays or breaks easily. It has a great warranty there are very few manufacturers with a 5-year limited warranty on their goods. This is not a complaint, but make sure to carry some batteries with you for your scope in case it does happen to quit on you! For a low budget crossbow to buy the Jackal Crossbow may be right for you. It comes highly recommended by many consumers who have bought it for sport and hunting. It is a good choice for beginners and offers you power, safety, and accuracy at a great price. You may find that you still need to buy some extra items to get the best performance out of your device like the rope cocking device and wax for the strings and a case. It is still a worthwhile package to buy and hope that our Barnett Jackal Crossbow Package Review helps you with making the best decision!